Embarrassingly tardy this, given that my trek in Peru’s Cordillera Blanca with Val took place last summer. Although I did a short post with photos when I got back (Back from Peru: Cordillera Blanca complete), sometimes I just need longer to be ready to revisit the trip in detail, adding photos to Flickr and writing up here. But now at least I’ve started… spurred on by having just booked flights to Kathmandu for me and Hazel to join Val on a trek in Nepal’s Tsum Valley over Easter. Photos are accumulating in my Peru, June/July 2014 album. Early start to get to LHR to check in on KLM flights KL 1002 (LHR-AMS) and KL 0743 (AMS-LIM). I’m getting better at flying solo, although I did have a small wobble as we circled back out over the Channel to kill some time before touching down at Schipol. Daytime flights worked much better than last year’s overnight with Iberia, and I landed in Lima just after 6pm, accompanied by a beautiful sunset. Alfonso was there to meet me and to drive me to Miraflores for a return visit to the Faraona Grand Hotel. Before relaxing too much, I nipped out to the Metro supermercardo on Calle Schell for supplies and some bits and pieces for dinner. Back to base for a shower, then dinner under the duvet with the TV and wifi for company. Alarm set for 7am. Lima to Huaraz courtesy of Cruz del Sur. Alfonso collected me from the Faraona and drove me to the bus station, looking after luggage check in and picking up my ticket. A long drive north along the Peru Highway 1 past the familiarly frightening super sand dunes of the coast, and then drying chillies and sweetcorn cobs once we had turned east and followed the river valleys up into the Peruvian Andes, passing over Punta Conococha (Punta Quñuqqucha, 4,100 m / 13,451 ft) in the rain. Free wifi, for so long as the coach was in range of a signal, and lunch on board. A very comfortable journey – better than last year’s. 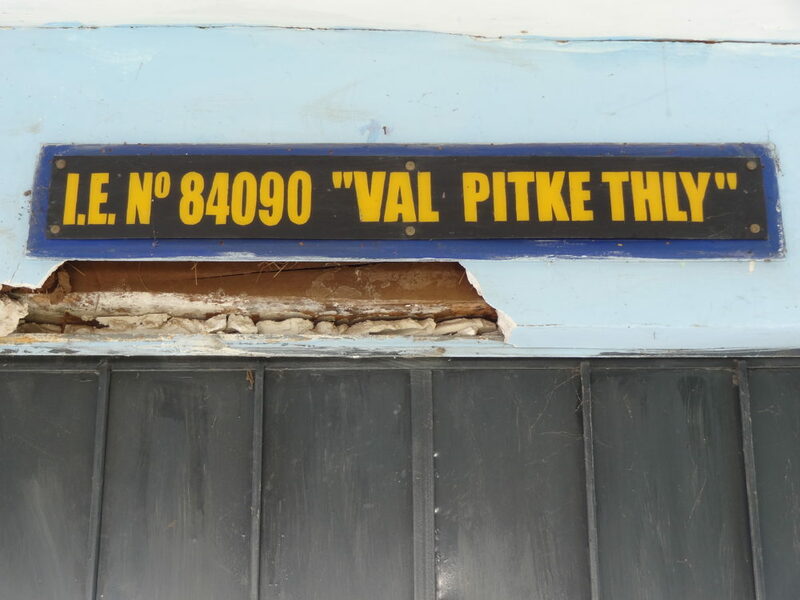 We arrived early in Huaraz (which I didn’t realise) and there was no Val to meet me at the bus station. Handily, it was only a short walk to our home from home in Huaraz, the lovely Hotel Colomba, which I took at a slow and steady pace given my rucksack had weighed in at 16kg and I was at just over 10,000ft above sea level… Just as I was checking in, Val and Patty rushed up – having discovered my early arrival once they’d got to the bus station, they’d run all the way back along the streets they thought I’d take. Once I’d settled into my garden room, it was straight out for dinner at the Bistro de los Andes, with Val and CB trekmates-to-be Dave and Mike plus Jono, one half of a Kiwi couple Val was sorting out “proper climbing” for. Tasty food – I went for Thai again – then back to base and to bed not long after 9.30pm. Jet lagged despite the ‘doing nothing’ day. Acclimatisation day 1….. but first the a long awaited return to the Hotel Colomba‘s breakfast room… YUM. Minibus via Melky’s to collect a guide for Jono and Clare, over the Río Santa and then up, up, up into the foothills of the Cordillera Negra, passing the municipal rubbish dump at the aptly named Pongo Alto en route. From our starting point near Shecta we had fantastic views over towards the Cordillera Blanca, but the clouds were covering them fast. A lovely walk, downhill all the way, through fields and farmland, until we reached the ever expanding urban sprawl of Huaraz. Early lunch at the Cafe Andino, then off to shop with Val and Mike for supplies to take to the LED health post in Quishuar – which included a chest of drawers and pillows for the volunteer medics’ bedroom. Afternoon tea in the gardens of the Colomba, then back out again to purchase school supplies. Our pre dinner trip briefing took place on the veranda, by which time Christine, the final member of the initial trek team, had arrived. At 6.30pm it was out for dinner at my favourite, El Rinconcito Minero or as I prefer to call it, El Minero Rincón. I don’t know why. Between ordering and eating (Chaufa vegetariano again), Val took Mike and me to get money – this year, thankfully, the BCP bank provided 500 soles cash no problem (300/S for tips, 200/S spends; ~GBP110). Another early night – I was in bed about 9pm for another good night’s sleep. Acclimatisation day 2 saw us leave the Hostal Colomba for a night, driving higher up into the foothills of the Cordillera Blanca to stay at the lovely Lazy Dog Inn, 600m higher up than Huaraz – lugging our kit bags uphill to the main lodge you could feel it. 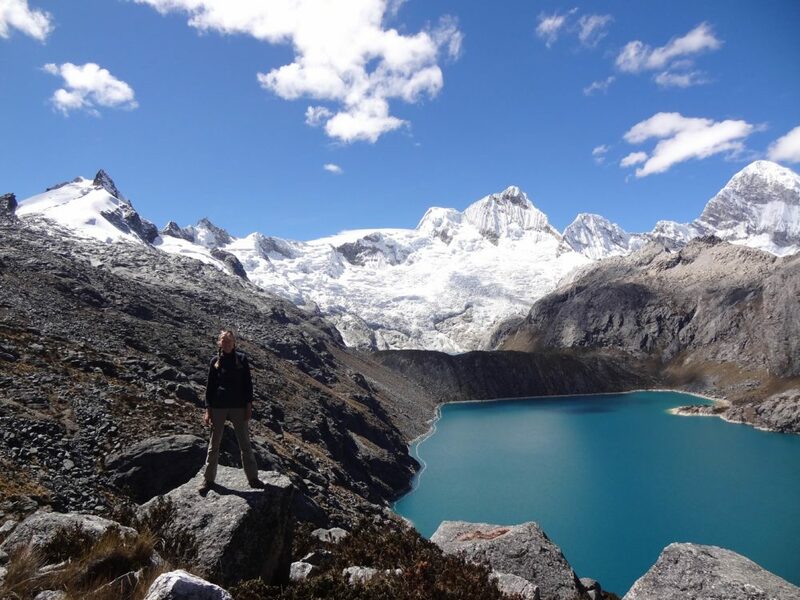 A stunning setting – superb views over Huaraz and to the Cordillera Negra in one direction, and up into the Blanca in the other. After teas and coffees with our hosts Diana and Wayne we headed off towards the Quebrada Llaca, walking up as far as the signpost that marks the edge of the Parque Nacional Huascarán (3,965m). Familiar from last year, we got the same smashing walking, lovely flowers and good views. We lunched at Café Yurac Yacu, a community cafe staffed by local Quechua ladies, just down the hill from the LDI. Fabulous food with a great view…. I opted for Quinoa salad (with sultanas, mango, satsuma, almonds, diced carrot and broccoli bits, all in a citrus dressing) followed by fruit crumble with yoghurt / chocolate brownie and ice cream (going halvies with Val), My only regret is that I didn’t buy one of the knitted hats! A leisurely afternoon, then pre dinner beers and chats by the open log fire with the other guests at the LDI before an excellent three course meal culminating in banana pancakes – delicious. But absentmindedly drinking the spring water was to result in The Return of Giardia during the night…. Having been denied the delights of fruit salad, granola, yoghurt, and fresh OJ and Cafe Andino coffee at breakfast due to my giardia guts, we said our farewells to the team at The Lazy Dog, and took taxis back down into Huaraz where Melky, Amner and our minibus awaited us at the Hotel Colomba. A day driving – initially north along the Callejón de Huaylas as far as Yungay, where we spent 45 minutes in the new town market and purchased hats from a very happy stallholder. We turned off the 3N and onto the 106 and started to climb up into the Cordillera Blanca, stopping to pay our entrance fee for the Huascarán National Park / Parque Nacional Huascarán at Llanganuco, before driving alongside the lovely milky blue-green waters of the Llankanuku Lakes. En route we had picked up two of our arrieros, Luis and Augustin who would be our trek crew in the Blanca. As we zig zagged up to the Paso Portachuelo / Llanganuco Pass (4,767m / 15,640 ft), Luis pointed out the local landmarks: Chinanqucha (the mother lake) and Urqunqucha (the father lake) and their ‘son’ between them, the peaks of Huascarán (6,768 m / 22,205 ft), Chopicalqui (6,354 m / 20,846 ft), Pisco (5,752 m / 18,871 ft), Huandoy (6,395 m / 20,980 ft), Chacraraju (6,108 m / 20,039 ft) and Yanapaccha (5,460 m / 17,910 ft), and the camp sites and refugios used by climbers. I was a slow learner. After a chilly photo stop in the clouds at the pass, we squeezed through the road-wide gap in the rocks and across the continental divide. A less hair raising descent through a gentler, greener landscape came complete with viscacha and (for me, Christine and Val) a lovely downhill leg stretch on a section of old Inca Road. Fabulous. There followed another long spell sitting in the minibus until we finally pulled up in Chingli’s playing fields around 4pm where we unloaded, pitched tents and settled into camp life. Fine views of Contrahierbas / Yanarahu (5,954 m / 19,534 ft), and of local villagers tending their flocks (of pigs?!) and the younger ones playing football. Coca tea in the dining tent segued into dinner: veg and quinoa soup, lomo saltado (sans beef for me), fruit salad. Then bed. My first taste of sharing a tent with Val…. * I’ve just realised that my camera captures GPS in 3D – height above sea level as well as longitude and latitude. So, despite Chingli being invisible on the web, I’m able to give its height. Very pleasing. A good day – our first day of proper trekking, and an amazing welcome into Quishuar where LED provide a clinic and local health worker, medical and school supplies, and solar lights. After breakfast of porridge, we made sandwiches and headed off up hill, climbing into the upland pastures and swopping great views of Contrahierbas / Yanarahu (5,954 m / 19,534 ft) for cloudier ones of ‘Toblerone Peak’. We shared our path with girls with sheep, boys with cows and ploughs – although they soon overtook us. Yanghirca Pass was a smashing spot for a picnic lunch, complete with Inca ruins set on a conical hill reached by the old Inca Road we’d been walking along, with clear lines of sight to other prominent hills, also with Inca remains. The pass also provided our first view of a condor and a smaller busy bird hopping from tussock to tussock which Val told me was a Cinclodes. A down hill run provided views of the green blue waters of Huecrococha / Wiqruqucha, but our destination was the village of Quishuar, further down hill on the banks of the river flowing from the lake. As we approached the gate into the village, we could see ladies in blue dresses and a small band which included a huge harp. As we entered the gateway, a group of children in brightly embroidered outfits started making their way towards us singing and sashaying to a folk tune played on pipe and drum. The girls carried crooks, one boy a short piece of rope. We were given an amazing welcome to the village, flower petals strewn before us, flowers presented to us. We stopped in front of the school, for the women and children to sing and dance in Val’s honour, and in due course we were invited to join in and lent hankies to flourish in the dance. I’ve never experienced anything like it. Wonderful. We also got to meet Anne and Michael, who had been volunteering at the health post that LED donors funded. Anne, who had been included in the welcome dance group, was joining us on our trek; Michael was returning to Lima for a second, more urban, placement. After tea in one of the school buildings (doubling up as our dining room for the duration of our stay, and a handy source of electricity for battery recharging – filming our welcome had used up a whole battery) we put up our tents in the playing fields before returning to the dining room for scrabble, dinner, two games of Ten Thousand and then bed. Our first acclimatisation day in Quishuar started off with 7.30am bed tea followed by a breakfast of quinoa enriched porridge in the kindergarten school room where we were joined by Anne and Michael. Our morning was spent on a great walk up the valley to the beautiful Huecrococha / Wiqruqucha lake with old Huayhuash friend Juan and puppy Jacob for company, although with overcast skies. Dave and Melky settled in for a morning’s fishing, while the rest of us continued up along the trail that climbed up behind the lake until we reached a rocky outcrop high above it. With a welcome thermos of mate de coca doing the rounds, we took in the panoramic sweep from the glaciers of the Cordillera Blanca, down to the lake and on down the valley to Quishuar and beyond. Val, Anne and I continued up to Laguna Orgoncocha / Urququcha, the upper lake whose waters fall into and feed Huecrococha / Wiqruqucha, and then returned to Quishuar for a late lunch of veg noodle soup, toasted cheese and tomato sandwiches (always a winner!) and lots of mate. A lazy afternoon – as the heavens opened, Val, Anne and I settled in for some scrabble, after which I took my turn in the new shower at the health post. The water was cold, but at least I got clean – and was prompted to do a spot of washing at the sink in the school grounds. Back inside, I caught up with diary (hence all this detail) and more tea, biscuits and scrabble ensued as the others materialised, including Michael from yesterday’s welcome party who’d come to collect his new school book, pencil and rubber. Soup, beef steak/egg omelette, potatoes and sweet potatoes followed by the sweet purple maize sauce pudding for dinner (aka Mazamorra morada), then a few rowdy games of Ten Thousand before turning in to the tent at 9.15pm – a late night! Our second day acclimatising in Quishuar involved a day walk to the Inca ruins at Yaino / Yaynu, leaving Val to focus on LED activities. Fuelled by a porridge and pancake (yum) breakfast complete with freshly brewed coffee, we set off under clear blue skies for a smashing walk. Amner and Augustin led the way, following the river downstream, crossing via an earth and branch bridge and continuing on along a clear path contouring on the north side of the valley – great views of the farms, senior school and churches scattered along its length. After climbing up away from the valley, we paused for a breather by a stream and a while later at a rocky outcrop with our first views east towards our destination. More contouring, then a steep climb over fallen stonework to the fine stone ruins. Perched on top of Pañahirka / Pañajirca, Yaino / Yaynu provided 360° panoramic views – to the west the peaks of the Cordillera Blanca were resolutely covered in cloud (although we could see their glaciers hanging down), to the east the rooftops of Pomabamba glinted in the sun down in the valley below. We sat on the fine stonework and tucked into lunch before taking lots of photos. Leaving the ruins at 12.15pm, a speedy descent (Hazel’s poles did a good job) and a hot slog brought us back to base just before 3pm, whereupon we prevailed on Melky to brew us some tea and to break open a packet of Oreos. Aided and abetted by Christine’s South American Spanish phrase book, the pirate-style request for Aguaaaaar paraaaaa lavarrrrrrrr made its first appearance…. the first of many. We whiled away the rest of the afternoon pottering – watching the football and volleyball matches on the playing field (dodging our tents), writing up diaries, and trying out more Spanish phrases on Melky, Augustin, Luis and Amner as they were hard at work preparing dinner, to great hilarity all round. We marked Dottora Anna’s last day at the health post with a mug of mulled wine (special ingredient: pisco), soup, spag bol (grated carrot, peas and tinned toms version for me), Michael’s orange jelly and Augustin’s fruit salad. A lovely evening, but I retired early to bed – to read and to listen to the rain on the tent roof…. Bed tea was scheduled for 7am, but I was up and about (packing) half an hour earlier. Today we were moving on from Quishuar to pastures and vistas new. Granola and Gloria strawberry yoghurt made another tasty breakfast, followed by sandwich making and a visit from the old lady who’d been brought to the clinic yesterday, bent double by arthritis but still living in a farmhouse high up in the hills above Quishuar. Luis and Augustin packed up the tents and we piled up kit bags, watched by the village school children who were slowly congregating in the playing fields…. with the natural consequence that more photos were taken. With a bit of a delay due to transport complications (aka the promised donkeys and medical horse didn’t turn up) and farewells to Juan and Michael who were walking the old lady home, we set off. Beautiful blue skies above as we crossed the Rio Huercrococha and walked upstream towards the Blanca, before taking a last look at the Lucma valley and turning right into the wider valley we’d seen yesterday, with its own winding stream and scattering of farms. Kiswar bushes (after which the village of Quishuar is named) lined sections of the path, and occasionally we found ourselves strolling through woods of Queñua (paperbark) trees. Easy walking up the valley, trying to beat the clouds to the snowy peaks of Nevado Pukahirka / Pucajirca Sur (6,039 m / 19,813ft) – we managed it, just. Wonderful views. Lots of photos. As the clouds gathered, we turn away from the Cordillera Blanca, for a tougher stretch walking uphill over grassland to the Tupatupa Pass (4,374m / 14,350ft). Lovely views over rolling hills and long valleys, but under gloomy skies. We lunched at the pass and waited for Melky, Augustin, Luis, Amner and the donkeys. Melky arrived first, carrying his new fishing rod – a present from Dave. Christine and I headed uphill (getting to about 4,400m / 14 440ft) to see if we could get a better view of Pukahirka – which we did, together with more peaks and ridges, snow and glaciers, glacier-scoured rocks and glacier-fed waterfalls. Definitely a pass to return to under cloudless skies. I took it slow on the steep downhill section from the pass, partly for the knees, partly for the views – the clouds were starting to lift and the snow shone brightly in the sunlight. Our destination was one of the farms on the hills above Jancapampa (Pishgopampa), and from high above we could see our tents being put up, and dark clouds gathering over the ridges on the far side of the valley and the glaciers rolling down from Nevado Pukahirka (maybe Pucajirca Central (6,014m / 19,731ft)?). Strolling through farmland we passed fields of beautiful blue flowers and the familiar ‘lupins’, which turn out to be chocho beans. Arriving in camp about 2.30pm, we settled into our tents – after three nights in Quishuar I’d got my camp craft down to a fine art – and pottered around the campsite, watching the flocks of sheep and goats being herded home for the day, shepherdesses spinning as they went. The farmhouses we were camping near had gardens of colourful flowers enclosed in stone walls. Tea and popcorn in the tent, with diary writing and Scrabble accompanied by the sound of an occasional patter of raindrops on the canvas, and the long low rumble of avalanches from above. Later in the afternoon we were visited by the family from the farm and a local trained nurse who looks after a disabled orphan. Superb dinner: soup (always! ), squash curry (surprise ingredient: strawberry jam to temper the chilli), tinned peaches. I’m afraid I wimped out of joining Val and the crew at the fiesta held at the farmhouse in honour of Val’s visit. The music played on pipe, harp and drum provided the soundtrack to sleep after a satisfying day of proper peaks. Not so sure what tomorrow will bring weatherwise…. Not so many barking dogs tonight, but heavy rain and a rooster at 4am instead. Awake early, and all packed by the time bed tea was delivered on schedule at 7am by Luis and Amner, along with the news that they’d had a fine time at last night’s fiesta. I regretted not going. Breakfast in the big tent, together with the nurse and the young boy. Anne and Val held an impromptu health clinic outside, tending an old lady with infected cuts on her hands, and working out some basic physio exercises for the boy. At 8.20am-ish we set off downhill past scattered farms with girls feeding pigs and men leading out cattle, and into the Quebrada Jancapampa proper. High above the glaciers remained shrouded in cloud. A fine walk along the flat, working around the streams and boggy bits, and meeting a couple and a solo man who’d come down from their farms in search of LED solar lights – duly distributed. We climbed out of the valley through woodland – hard work, but satisfying when we emerged by a babbling brook for a drink and sweets in the sunshine. A slow and steady walk – sometimes flat, sometimes steep, sometimes in the open, sometimes in sparse woodland, at other times scrambling up dry waterfall gullies – brought us to a wide open upland valley where the donkeys were being unloaded. The farmers at Jancapampa had rented us some more donkeys and a medical horse. En route, wild flowers galore, and a hummingbird sighting. Anne, Mike and I mucked in to pitch our still damp tents on neatly grazed grass sprinkled with flowers and took photos of the super scenic setting while lunch was prepared – a feast of veg noodle soup, toasted cheese and tomato sandwiches with pimento stuffed olives, gherkins, tuna and guacamole adornment options. Lots of tea. Revitalised, Christine, Anne and I put our boots back on and clambered over rock slabs above the camp to explore – fabulous views of the ridge coming down from the pass and the valley wed’ walked up, a hidden loch and the rare red shongo shongo plant. A lovely stroll back to camp for a wash (with Aguaaaaar paraaaaa lavarrrrrrrr, naturally) and a read – The Guardian Book of Mountains, appropriately. The rest of the afternoon was whiled away in our now familiar routine – tea, diary, Scrabble/Yahtzee/Ten Thousand. All very sociable, but easily so. Another gem of an evening meal – Bean soup with egg drop and spring onion garnish, BBQ chicken and chips (BBQ-sauced champignons for me), broccoli and carrots. All rounded off with panettone and custard. The camp fire kept us warm as the chickens roasted and we star gazed…. the daytime cloud cover breaking up to reveal a sparkling night sky. A cold night ahead. Feeling truly away from it all for the first time. The best day of the trip, with beautiful blue skies, gorgeous green valleys and stunning views of the Pukahirka peaks. We woke to frost on the tent, clear skies above. Setting off slowly, after the usual breakfast and packed lunch preparations, we spent the first 40 minutes in cold shadow climbing up one of the many valleys coming down from Nevado Pukahirka / Pucajirca Norte (6,046 m / 19,836ft). Emerging into the sun and above the vegetation line we had a breather to take in the view back down ‘our’ valley and then started towards the Yanacon pass zig zagging up on a path through the scree. Very windy – I almost lost my Yungay hat, and my hair flying around my face proved disorienting as well as annoying. Silly not to have put it into plaits. The descent was hard – the path dropping steeply away from the pass, loose earth and small stones underfoot. Definitely hiking pole terrain – I was glad of Val’s advice on the way up but even so I lagged some way behind the others. After a rest at a rock in the middle of the valley, we continued on over the grassland, making for the farm at the end of the Quebrada Huillca where three valleys meet and alpacas graze. So green. The next stretch, across the valley junction, looked easy …. until we realised there was a river running through it. Boots off, poles engaged, water COLD. Worth it though, as we looped back round towards the Cordillera Blanca‘s northern section and entered the Quebrada Safuna. A beautiful wide valley, the river running lively and clear over rocks and stones, two majestic mountains ahead of us (the peak of Rinrihirka / Rinrijirca on the left, the ridge of Tayapampa to the right), powerful rock ridges either side. A perfect place to pause for lunch. Just stunning. We spent the next hour or so each walking at our own pace, naturally separating out to enjoy this place in solitude. As we walked up the valley, the two peaks we’d been admiring from afar drew closer… only to be dwarfed by the peaks of Pukahirka was they came into view from the west. As our campsite came into view far down in the valley below, Val suggested continuing on along the contours, towards the Safuna lakes. Pukahirka just got bigger and better as we walked on – solid ridges of snow, glacier blue through sunglasses. Snow covered peaks galore, from elegant spires to bulky mushrooms. Our contour path moved onto a ridge, which was home to with lupins, shrubs and lots of small birds. Down below us, the waters of Laguna Safuna baja sparkled blue and brown, separated from the upper lake by a vast moraine wall. Anne, Mike and Dave opted to stay there and admire the view before making their own way down to the camp, while Val, Christine and I continued up the grassy ridge towards Laguna Safuna alta, passing the ruins of buildings dating from the work done to repair/reinforce the moraine wall after the 1970 earthquake. More stunning views of the Blanca ranged above us, from Nevado Pukahirka / Pucajirca Norte on our left, to Nevado Pukahirka / Pucajirca Central, then (I think) Rinrihirka / Rinrijirca and (I think… not sure!) Nevado Jancarurish, their slopes and glaciers dropping down into the teal blue waters of the Laguna Safuna far below the huge rich chestnut red boulders that formed the moraine wall at the end of our ridge. Definitely a photo stop. A speedy descent brought to the shores of the lower lake and then back to camp where popcorn and scrabble awaited. A magical riverside location, with mountains on three sides and the Quebrada Safuna / Tayapampa falling away on the fourth. Condors coasting on thermals overhead. Sunset turned the clouds and snowy mountains pink then blue, as a big bright moon rose above. Another great day. A cold night meant frost on the tent’s plastic window pane again, and the condensation on my sleeping bag, left out to dry off, froze in the open air. More clear skies, more beautiful views. Fuelled by a pancake, peanut butter and honey breakfast, with proper coffee, we set off across the wide bowl of the Quebrada Safuna / Tayapampa, heading for Mesapata Pass. Our first hurdle – crossing the cold and fast flowing waters of the river. Once accomplished, we enjoyed a lovely traverse over gently rising grassland, with wonderful views back to Nevado Pukahirka / Pucajirca, before a final zig zag brought us to Safuna / Mesapata Pass and smashing views down into the Quebrada Mayobamba. Walking up the valley, we met another donkey train and crew going in the opposite direction, and a little later their New Zealand tramping clients. We encountered more humans on the climb up to the Gara Gara / Caracara Pass, an american couple about to start an early lunch at a flat section part way up the path. We took out breather by the (drying up) lakes at the foot of the pass, which is when our donkeys and the guys caught us up. A stiff climb up on a path through the rocks and scree brought us to the Gara Gara / Caracara Pass, and stunning views out over the entire Santa Cruz range – Tayapampa (5,657m / 18,560ft), Jancarurish (5,578m / 18,300ft), Allpamayu / Alpamayo (5,947m / 19,511ft), Kitarahu / Quitaraju (6,040m/ 19,816ft), Pumapampa (5,300m / 17,388ft) and Santa Cruz Grande (6,259m / 20,535ft) – and down into the valley below. Wonderful, and very, very windy. A seriously steep path down and stunning views, but too steep/slippery/windy to look anywhere but at my feet until we got low enough to be sheltered from the wind. The scenery was still awesome – an amphitheatre in the Andes, grouped around the teal blue waters of Laguna Jancarurish. We lunched on a rocky outcrop a short yomp from the path across thigh high tussock grass, and then tackled the steep descent into the Quebrada Alpamayo, spying our tents, and the Americans’, at Alpamayo BC (North). After helping to pitch tents as the wind picked up we spent the rest of the afternoon in familiar pottering style – diary writing, tea drinking, game playing – with a bit of washing and yoga thrown in. Lots and lots of photos of Alpamayo’s Toblerone peak, particularly as it turned golden in the evening light. An easier (lower altitude) day today. Back in Blighty it was Cat and Mark’s wedding day. After a lie in to give the sun time to make it to the Quebrada Alpamayo, we started with a morning stroll up to Laguna Jancarurish (4,386m), with morning sunlit views of Allpamayu / Alpamayo (5,947m / 19,511ft) and Santa Cruz Grande (6,259m / 20,535ft). The hardest parts were the three stream / river crossings – I am not renowned my gazelle-like leaping abilities…. but I didn’t get wet this time. The rest of the morning was spent with our backs to the Blanca, following the Rio Alpamayo as it flowed downstream. Lots of Inca ruins dotted along the valley, and ‘modern’ farms and fields which must trace back to those times. We lunched amidst the ruins of Ruina Pampa (~ 4,000m / 13,123ft ) – a vast complex, with terraces covering the sunnier hillside on the other side of the river – and watched horses being rounded up way down in the valley below. A little later Melky bought one to replace Blackie, our medical horse on last year’s Huayhuash Circuit. Many happy hours were spent thinking up names for the new horse – Cappuccino coming a close second to Toffee (I think….). We left the ruins by an old Inca staircase, which provided a steady ascent all the way up to our camp for the night, tucked away in a corrie with views of snowy Cerro Milluacocha (5,244m / 17,206ft) on the far side of the valley. Melky and team had a mid-afternoon snack of veg noodle soup (and lots of tea) waiting for us, after which Val gave Mike and I a run through the kit we’d need for tomorrow’s snow/ice training for novices (gulp): Scarpa boots, crampons, helmet, harness, ice axe and warm gloves – that’s half my kit bag! Kit check, diary writing and scrabble were accompanied this afternoon by Peruvian pop – Melky had got his transistor radio working in anticipation of the final games in the 2014 Football World Cup. Third place play off today and The Final tomorrow. Even in the mountains you can’t escape…. As dusk fell, a large local family materialised to collect the Light Education Development (LED) solar lights we’d brought for them, and bringing an old ram and a large sack of potatoes to show their gratitude. Vivid, ghostly dreams overnight, which I suspect stemmed from nerves about today’s Nevado training. After breakfast Dave helped me fit my crampons to my Scarpas – which I should have done back in Huaraz – more subliminal messaging? Anyway… too late now to back out! A lovely morning’s walk climbing high above the Quebrada Alpamayo (aka Quebrada de los Cedros at this point), to the pass below which we’d spend the night. Anne, Christine and Dave were to have a leisurely afternoon there, but Val, Amner, Mike and I were heading off to learn how to use crampons, rope and harnesses for walking on snow – training for the planned ascent of Pastoruri in the Southern Blanca later this week. Carrying my Scarpas in my daypack didn’t leave a lot of room for much else, but I managed to squeeze in the necessaries – my Goretex jacket, gloves, harness, water and lunch – strapped the ice axe on the back and wore my helmet… we’d a long walk across a boulder field and up/down granite rock slabs to reach the snowline, and I wanted to wear my more familiar, flexible Salomons for that. A tough walk up/in, but superb views from the snowline where we had a speedy (nervous) lunch before Val sorted us all out, fitting harnesses and crampons. A trial walk up/down a small snow slope, then a crampon clad climb over rocks (tricky) to the main snow. Here Val roped us up and we practised walking/climbing the slope with ice axes and crampons, without snarling up the rope – or one another. Exhilarating in the silence. Mike and I finished on an adrenaline high. In no time at all (it felt), we were heading back down to the snowline to don daypacks (and to swop boots). Smiling photos, then a speedy descent with a tricky final section through tussock grass and bog, reaching camp around 3pm tired but elated. Tea and popcorn awaited – smashing. A lovely campsite, complete with radio reception for Melky to follow the 2014 Football World Cup final – Germany v Argentina. Dinner at 7.15pm had had to wait until the final score… 1-0 to Germany in extra time. Bean soup, Aji de Gallina / Hongos and rice, dark chocolate sauce for dessert. Very windy outside. Bed at 8pm – it’s a 5am start for Val and Christine tomorrow for their ascent of Nevado Viscacha (so called because it looks like a Viscacha’s ear). More breathtaking scenery on our final full day in this part of the Cordillera Blanca. Val and Christine were up and off to climb Nevado Viscacha, which meant Anne, Dave, Mike and I had a leisurely breakfast before setting off on the path to the first of the day’s two passes. Clear again, and cold at 4660m / 15290 ft, puddles frozen solid in the shade. At the Los Cedros pass the Cordillera Negra came back into view, and we waited for Melky and Toffee to catch us up. Then on to the next pass, Osoruri, not far off but with a steeper ascent over bare rock, emerging in to a very barren environment of shattered rocks and boulders. Beautiful but bare, with a glimpse of the snow capped peaks of the Santa Cruz peaks. After a breather, we continued down to the mirador… where we were rewarded with a stunning view of the Santa Cruz range grouped around the beautiful teal blue expanses of Laguna Cullicocha / Hatunqucha / Pirqarumi and Rahuqucha / Rajucocha, the glacial lakes which Mike and I had spied from yesterday’s nevado training vantage point. Melky spotted Val, Amner and Christine, far off on the left hand side of the lake, still high up on their descent, and we followed their progress round to rendezvous and lunch with us at the mirador. Mission accomplished; Viscacha vanquished. A speedy descent brought us to the natural / Inca-assisted rock dam at the foot of the lake, plus the 20th century hydro electric plant, and we lazed on the warm rocks by the water’s edge for more photos – and an inelegant attempt at rock hopping/topping on my part. Then, downhill all the way (with one stretch of up) to our campsite. To begin with our route clung to the contours of the cliffs, generally following the Inca water channels on our right, a sheer drop into the deep dark valley where cascading melt water from the lagunas had hewn its route through the rocks. As the rock cut path transformed into a hillside track, we exchanged views behind us of Nevado Viscacha (aka Monte Christina Vegetariana) for vistas of the Cordillera Negra and villages and valleys below. Still steep going in places. As our tents came into view below, Val pointed out Inca ruins perched on a ridge far away on the other side of the Quebrada Alpamayo / Quebrada de los Cedros. Closer by, Queñua trees with bright red brush-like flowers decorating their branches like tinsel. Beautiful. Ours were the only tents at Huishcash campsite. At a ‘mere’ 4,320m / 14,173ft it occupies a lovely location, looking out over the Callejón de Huaylas and with a stream chuckling its was along one side of the site, providing water for cooking and washing. Sorted out the tent, sorted out tips and thank you postcards, then adjourned to the dining tent for scrabble and dice and to escape the cool breeze…. which meant I also missed the most of the sunset. After dinner it was time for heart felt, end of trek Thank Yous to Melky and Amner (who we’ll see in part 2 of the trip down in Pastoruri), Augustin and Luis – with Christina’s LP phrasebook proving invaluable once more. Outside, a stunning starscape with (for those that knew) Taurus clearly identifiable above the Llama’s Eyes. Twenty years ago today I was in Bolivia with Tom and Matt – Potosí I think – and 17 years ago I became an auntie. A leisurely late bed tea at 7.30am, breakfast, sandwich making and headed south, on a speedy downhill hike to Hualcallán, the ‘new’ village that doubles up the entrance into this part of the Parque Nacional Huascarán. Looking down at patchworks of fields covering what looked like every inch of reasonably flat terrain on the escarpment below, we talked bucket lists and travels. We were in the village by 10.20am and our coach materialised about half an hour later, soon followed by our trek crew, kit and donkeys. Bags were bundled in the boot of the coach, together with “No Balls” (aka our gift ram) and after fond farewells with Luis and Augustin, we settled into our seats for the journey back to Huaraz. A switchback dirt road eventually brought us to the Río Santa deep down in the Callejón de Huaylas, and the tarmac road (the 3N). A little after 2pm we were drawing up outside the Hotel Colomba, and I for one was dreaming of hot showers and a hairwash. My decision to hand wash my MK fleece proved ill judged….. the wringing water was still coming out dirt brown on the third rinse. Rendezvousing in reception at 3pm, Val speed walked us to Cafe Andino where we tucked into coffee, cake, fresh fruit juice. Refreshed, we went our separate ways – my mission was accomplished with postcards from the shop on the floor below Cafe Andino (s/2 each) and stamps (s/6 each!) from the Post Office on the Plaza de Armas. 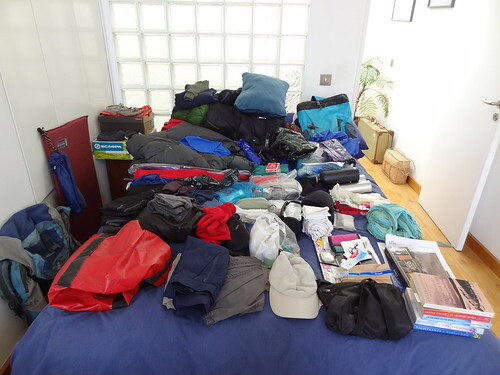 Back at the Colomba, my room looked like a jumble sale, as I unpacked everything from my trek bag and sorted it into piles – one of things to leave at the hotel and one of things to take on our three day excursion south to climb Pastoruri. As I packed, ESPN was showing a documentary about Hillsborough. At 6pm, we convened for pre-dinner drinks and nibbles on the veranda, where we were joined by Val, Antiona and Patty – the perfect (engineered) opportunity for me to hand over the photobook I’d made of last year’s Huayhuash Circuit trek for the family. A return to El Rinconcito Minero for dinner – veggie lasagne and chips to share for me and Christina, red wine/beers all round. Back in room 14, the TV remote lured into channel hopping until 10.30pm. A restless night which might have been due to the beers, or, possibly, worrying about Pastoruri…. The ice cream van-like jingle of one of Huaraz’s dustbin lorries woke me at 6am, which allowed for half an hour checking email at one of the Hotel Columba’s three computers before breakfast at 8 am. A speedy trip into town with Val for final supplies for our foray into the Southern Blanca before returning to the hotel to say our goodbyes and farewells to Anne who was heading back to Lima, and then home. Around 10am-ish we boarded our minibus, picked up Amner, Melky and Antonia, and took the 3N south out of Huaraz, following the Río Santa as it worked its way through the Callejón de Huaylas. We paused in Recuay for some more supplies, and a while later we turned off the main road and into the Quebrada de Pumapampa / Pachacoto, following the aptly named Carretera a Pastoruri back into the Parque Nacional Huascarán. This part of the park is a a popular day trip from Huaraz and we encountered lots of minibuses and an occasional coach as we drove up the valley, pausing only for a photo stop at a roadside Puya Raimondii. Our campsite was at the point where Quebrada Pastoruri peels off out of the Quebrada de Pumapampa. We set up tents, had lunch and then Mike and I went with Amner for a trek up the valley lured towards Nevado Tuco. We hiked up to ~4,785m and were rewarded with views into a valley of colourful ridges and vertical rock strata that veered off to the left of the main valley we’d come up, and down to the farm – a thatched house surrounded by stone enclosures – at the river crossing below. Cows and sheep scattered across the hillsides. On the final stretch back towards camp, Amner pointed out a brown bird of prey (possibly a Puma Hawk) that had just made a kill, and I stayed behind taking lots of photos. Back at base the rest of the afternoon featured the usual amusements of scrabble and dice, and some rain. Another fine dinner, and the sky had cleared by the time we went to bed at 8pm – we’re up early tomorrow for Pastoruri. 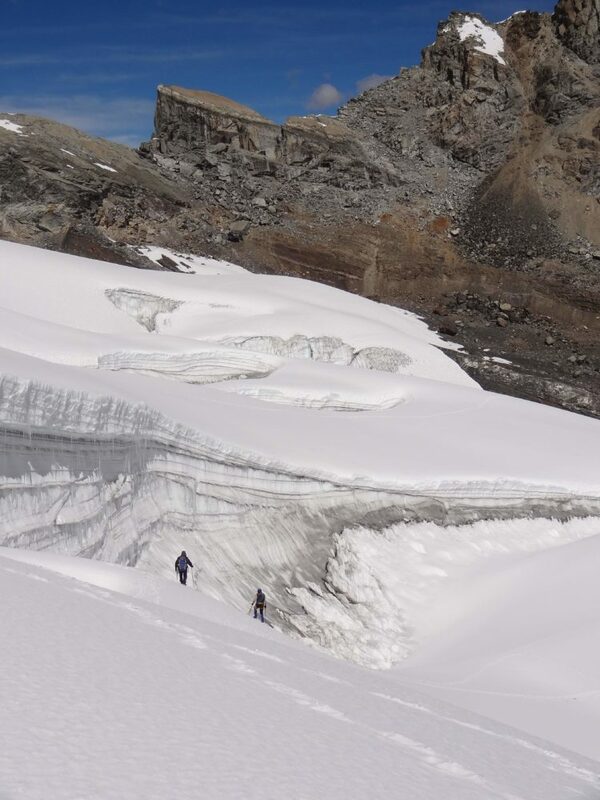 Quite literally the high point of the holiday – cramponing over the Pastoruri glacier and up to the top of Nevado Pastoruri. Bed tea at 5.15am. Clear skies. Cold. I’d packed yesterday – a tight squeeze fitting my Scarpa boots plus harness, crampons and water into my Lowe Alpine daypack again – and wore Val’s PHD down jacket, my hat, scarf and gloves, and helmet. Ice axe strapped to the back of my pack. We followed yesterday’s route back up the Quebrada Pastoruri towards the farm, where we crossed the stream and headed up a left hand valley passing some frozen lakes. Hard going over tussock grass ad then moraine – sighting three vicuña provided a highlight. We were at the glacier by 8am, and in the sun. We donned boots and crampons, harnesses and helmets, and then Val roped us up. Amner, Christina, Mike and I were with her; Dave was with Melky. As you’ll see from the “before” photos, I was very apprehensive. The pace and the steepness tested us all I think, as did keeping the rope taut and clear of our crampons, but getting up close to the glacier face, dripping with icicles, was amazing. We traversed the snow cover and then side stepped the final steep section to the summit. 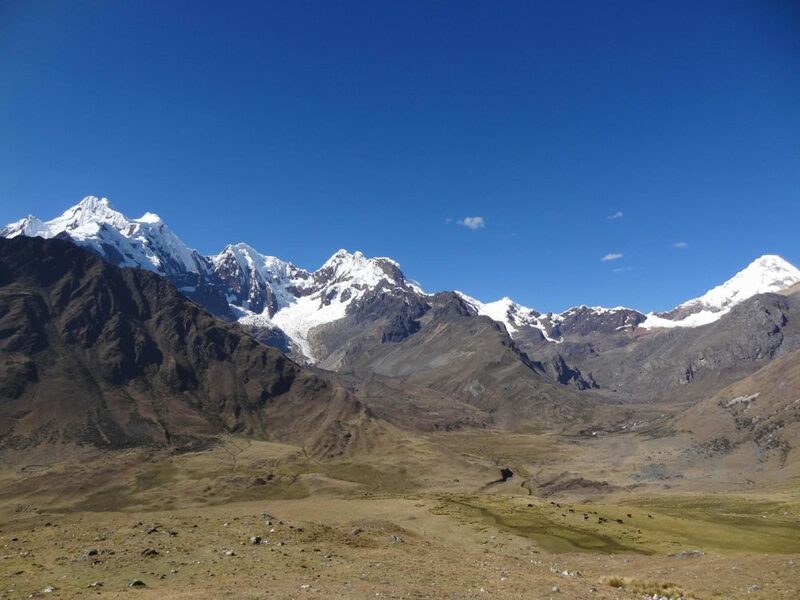 A short stay at the top perched on prickly rocks to take in the fantastic views of the Cordillera Huayhuash, and back down into the Quebrada Pastoruri, then a careful descent. Exhilarating, but I was glad to be back on (relative) terra firma, even with the tricky leap from the snowline onto the side of the moraine. Tired legs and wearing too many layers plus helmet (due to lack of room in my dayback) made for a tough trek back to camp, and prickles in the grass didn’t help my mood either. Back in camp we soon perked up with the help of veg noodle soup and a late lunch, but when my one and only headache of the trip kicked in a little later I retired to Lobo y Zorro with a couple of Ibuprofen for a bit of reading/snoozing (mainly the latter, snug in Val’s down jacket and under my sleeping bag). Pre dinner scrabble with very strong hot choc, then our final Melky meal – mulled wine, soup, veg spaghetti, hot fruit salad, coca tea. Back in bed by 8pm. Not a great night’s sleep – so I was up and out in the frosty morning soon after Val. Last night’s teeth cleaning water was frozen in my camp mug. I crunched across the frost cover to the dining tent, early but proper coffee was already brewing and my favourite breakfast combo awaited: granola followed b a Melky-special fried egg. I thought I’d overdone breakfast seeing as the morning activity plan was to walk back up the Quebrada Pastoruri to the farm to check on the LED supplied solar light Val had given the farmer there last year. I should have known better… Mike and Dave opted for R&R in camp, and Christine and I set off at with Val, Melky and Amner at their ‘usual’ pace, aka fast. As we approached the farm, a large dog appeared to check us out, closely followed by a jolly white dancing dog we christened Mr Crufts. As Val chattered with the farmer, a fat chicken, a large cat and two cute puppies kept court in the farm yard. 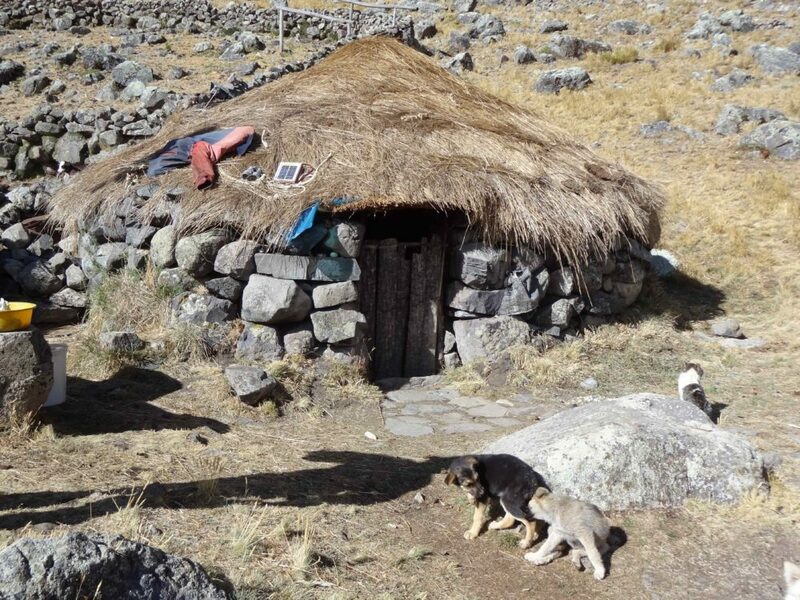 The doors of the stone store hut were made from dried Puya Raimondii, and the solar light was recharging on the thatched roof, alongside an old pair of metal binoculars. Having heard that the lakes we’d passed yesterday were empty of fish, Melky turned back to camp leaving the four of us to continue up the main valley…. always one more ridge or rock to reach…. worth it though when we reached Laguna Tuco. Beautiful colours in the surrounding landscape, a condor and a pair of vicuña. The clouds were closing in and a cold wind had sprung up so after photos and a restorative Cañonazo chocolate bar shared by Christine, we headed back down the valley. Back at the campsite we warmed up with hot chocolate made with fresh milk from the farming couple who’d collected solar lights yesterday, followed by a lunch of pitta pockets filled with guacamole, cucumber and tomato. Our minibus arrived early, at 12.15pm ish, so it was a speedy pack up of bags, tents and camp kit – all done in 15 minutes or so. We drove through the Quebrada Pumapampa / Pachacoto and out of the Parque Nacional Huascarán, with just a couple of stops – at the petroglyphs and to check on more LED lights distributed last year. Then the high road back to Huaraz. Another shower in room 14, and the final set of clean(ish) clothes (the ones I’d travelled out in) and I was ready for our trip into town – Mike to collect laundry from Lavandería Liz, Christine to deposit some, and various pills from the Medifarma including Albendazole Giardia worm-blitzing pills for me. Cafe Andino was our ultimate objective, where we met up with Dave and sat out on the terrace indulging in coffee and apple pie. Next up: beer and nibbles for this evening’s farewell gathering back on the Hotel Columba‘s veranda. Christina and I were in charge. Sierra Andina proved impossible to come by – it’s fiesta time – so we settled for Cristal. A lovely early evening drink, snack and chat with Amner, Antonia and Melky, then a slightly tipsy walk to El Rinconcito Minero for more beers and another great meal – Christine and I sharing a veg chaufa and chips. Back at the hotel, I managed to get everything back into my rucksack, just about. It required a fair amount of brute force! Stupidly succumbed to the TV again, flicking through the channels until almost 11pm and pick up more news about the increased Israeli shelling of Gaza and the shooting down of Malaysia Airlines MH17 over the Ukraine. 6am fireworks. 7am up. 7.30am check email. 8am breakfast, the last at the lovely Hotel Columba. Finished packing and lugged my rucksack and daypack, both bursting at the seams (no idea why or how, given everything I’m taking home travelled out with me), to the front garden. 9.30am Val and Antonia sorted out luggage transfer and check in with Cruz del Sur at Huaraz bus station, while Dave, Christine, Mike and I headed off to Cafe Andino for coffees, juices and end of trip chat until it was time for Mike and I to say our farewells – we were on the 11am departure for Lima. Upstairs seats, so a better view but (slightly) less plush. Two movies provided on board entertainment as we climbed back to the Punta Conococha / Quñuqqucha (4,100 m / 13,451 ft) and then descended all the way to sea level on coast. Grey cloud had replaced the blue skies of the Cordillera Blanca. The traffic made for a painfully slow journey through the outskirts of Lima, and we drew up at the bus station around 6.30pm. Alfonso was there ready and waiting to drive us speedily back to the Hotel Faraona. En route, a slightly unclear conversation about parades in Miraflores tomorrow and their possible impact on our airport transfer pick up, which continued with the man at the check in desk. In the end it was agreed that the Repsol petrol station at the turn off from the dual carriageway would be our Plan B Rendezvous. After our complimentary Pisco Sour at the bar (and checking in for tomorrow’s KLM flight), we headed off to the supermarket for sustenance, and water – Mike and I agreed we were too tired for dinner at Las Tejas. Back in my room, my Metro dinner was consumed alongside email (courtesy of the hotel wifi) and TV. Lights off at 10pm. Mike and I were on the overnight KLM flight back to Schiphol, so we had until early afternoon to amuse ourselves in Miraflores. We decided to stroll down to the waterfront, and to lunch at Les Tejas. The main road was lined with crush barriers and people setting themselves up with picnics and blankets, ready for the Corso de Wong parade, getting in early for Peru’s Fiestas Patrias. In the cliff top gardens by the lighthouse, pet dogs were being put through their paces on a canine obstacle course – some were keener on it than others…..
After checking out of our rooms at the Hotel Faraona, we visited the indoor ‘market’ for some souvenir shopping and then headed down to Las Tejas for a leisurely early lunch. Back at the hotel by 1.30pm, Alfonso materialised and whisked us out of Miraflores before the road closures began. A speedy journey to the airport meant Mike and I had plenty of time sat by the KLM check in desks – tulips were the clue. Slept some on the overnight flight, with a wake up call as we approached Ireland on Monday afternoon. We landed on time in Schiphol – rainy Amsterdam looked a lot like gloomy Lima. Mike and I headed on for our connecting hops home – mine handily to London City Airport. Plenty of time for a final catch up on diary, sat at the tables and chairs with sockets in the departure area. They know their market. Best of all, finding Phil waiting for me at LCY. Another fab three weeks trekking/climbing courtesy of Val, exploring some of the lesser known locations in the Cordillera Blanca after a humbling few days acclimatising in Quishuar where Val’s LED charity funds the school and the health post (Medics, volunteer!). On arrival in Quishuar, we were welcomed by dancing children strewing flower petals along our path and then serenaded by the young women of the village – everyone in their best traditional dress. Once on the trek proper, vertiginous passes with gale force winds (I’m talking about you, Gara Gara / Cara Cara) led to plenty of wild campsites with stunning views – the one at the foot of the Nevados Pucahirca and the Safuna Lakes being a particular highlight. Plenty of Inca ruins en route, culminating with the aqueduct and channels at laguna Cullicocha – with its stunning array of peaks. Throughout, Val distributed solar lighting units to new recipients and checked that all was well with those who had received lights on previous trips. When you see just how basic life is here, you realise how big a difference having a light must make. On the upper slopes of Nevado Viscacha (aka Nevado Christina Vegetariana) in the Northern Blanca, Mike and I were trained in how to use crampons and ropes in readiness for our subsequent successful ascent of Nevado Pastoruri (5240m) via its glacier, as we rounded off the trip with three days in the Southern Blanca. A super group – thank you Dottora Anna, Vegetarian Christine, Pirate Dave and Marathon Mike for your good company, conversation and scrabble / dice / card sharp skills. And muchas gracias to Val, Melky and Antonia, Amner, Augustin and Luis – I’m sure we’ll all forever share those memories of Aguaaaar paraaaaa lavaaaaargh. 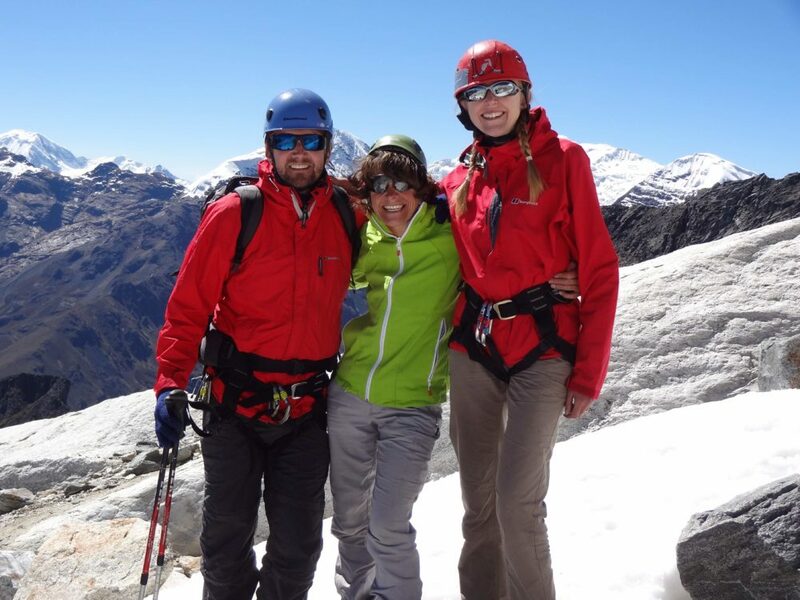 February 2015 Update: Read about the trek day by day in Cordillera Blanca: photos and notes. As end of term approaches, I’ve been making my final preparations for Peru – I’ve got money from M&S, travel insurance from Campbell Irvine, trekking poles and pillow from Hazel and puzzles galore from Catherine. And the bank has made a note of the dates I’ll be in Peru, so hopefully no problems with using the ATMs – unlike last year. Back to the yr.no website to keep an eye on the weather – although their offering for Peru is somewhat limited, with data for Lima and Huaraz only in terms of where I’ll be. Still, better than nothing. Huaraz is looking a little damp though…. Kit has been gradually accumulating on the spare bed, but I’m going to have to be ruthless in my packing given that I’ve got mountaineering boots and a harness to take on top of my usual kit. I’ve been meaning to keep a log of what I actually take and what I actually use for a few trips now…. this might be the time! At least we have a day back in Huaraz between the trek and the climb, which allows for some laundry. Next job: working out when to set the alarm for so that I can do online check in…. But first – a cup of tea and Glastonbury on the TV. 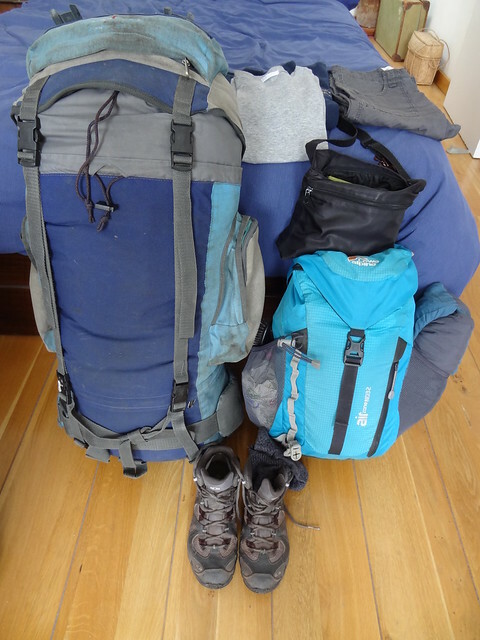 Update – 29 June 2014: Peru trek kit, photographed and packed. Where Next? Back to Peru…. 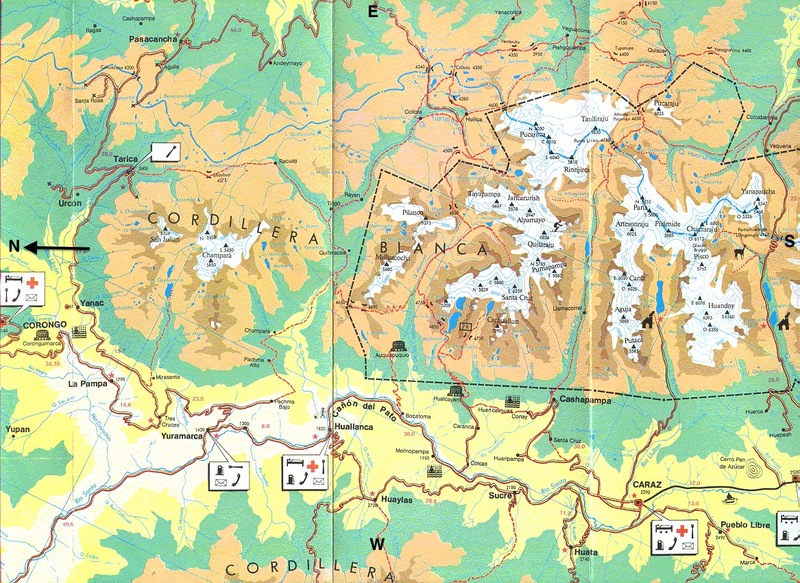 Destination: Back to Peru to the Cordillera Blanca aka the section of the Peruvian Andes that stretches north from Huaraz; contiguous home to the Huáscarán National Park (UNESCO World Heritage Site No 333). Why: To trek and climb in some more high, snowy mountains. How: A two week trek with Val Pitkethly at the helm, and hopefully a chance to try my hand (and balance) at non-technical winter climbing involving crampons and ice-axe. Itinerary: Details from Val today! I name this trip, Val Pitkethly’s Cordillera Blanca. Day 1: To Huaraz 3050m; acclimatisation. Day 2: Depart for Chingli – 6 hour drive via Llanganuco pass 4760m and then descend to Colocabamba and on to Chingli; views Huascarán, Chopicalqui etc. Day 16-19: Climbing in southern Blanca. No folks and beautiful area with lots of wildlife and birds – truly magical spot. Day 20: Return to Lima. Getting there/back: I booked my flights back at the start of December, which made them a lot cheaper than last year! Hopefully KLM‘s London – Amsterdam – Lima (and back) will be a better long haul experience than last year‘s lack lustre London – Madrid – Lima courtesy of Iberia.